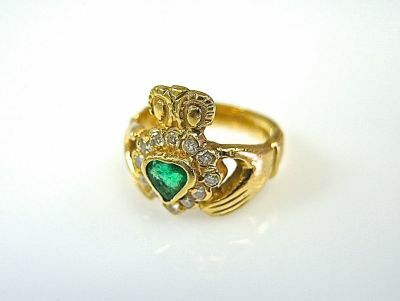 A beautiful 18 kt yellow gold claddagh ring with 1 heart facetted cut medium intense emerald, est. 0.42ct and 12 round brilliant cut diamonds, est. 0.36ct (VS clarity: G-H colour). There are other localised variations and oral traditions, involving the hand and the finger on which the Claddagh is worn. Folklore about the ring is relatively recent, not ancient, with "very little native Irish writing about the ring", hence, the difficulty today in finding any source that describes or explains the traditional ways of wearing the ring.